I have to share with you this beautiful picture of the temperature distribution of the universe called micro-wave background radiation: see here. 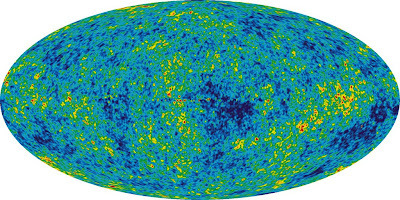 It is a snapshot of the start of the visible universe when the universe cooled down sufficiently from the big bang to allow light to travel over long distances rather than being re-absorbed by the hot plasma. This event happened 300'000 years after the big bang which happened 13.7 billions years ago.You can see that the temperature (which is -270 degrees Celsius!) is not completely evenly distributed; there are minute difference of 0.0001 Celsius. These differences are the seeds that made galaxies form, and stars, and planets, and life, and humans, and people you stutter! Without these tiny temperature fluctuations 13.7 billion years ago you wouldn't be stuttering! Isn't that amazing. 'm glad to see you relaxing occasionally by discussing an interesting topic other than stuttering. I'm sure you have interesting thoughts on lots of things. Hi everyone, I would like to talk to stutterers with the Skype. I'm a Taiwanese, and I'm lovin' in English. Theoretically, I can speak English very fluently. I know very well what to say. I seldom hesitate what to say in English. However, I stutter so I can't give my real linguistic competence. Actually, I also stutter in Chinese, my mother tongue, but not as severely as in English. I am eager to practice my speaking English with stutterers at least two times a month. Anyone who stutters want to chat with me on the Skype? If anyone wants to chat with me on the Skype, please e-mail me.